Peer-to-peer fundraising is a fantastic way to raise money for your organization. You have people on the ground, gathering support from each of their individual networks, but how can we push those fundraising efforts even further? The answer is corporate matching gifts. How can matching gifts be used to increase peer-to-peer fundraising revenue? $4-7 billion in matching gift revenue is left on the table every year because so many people are walking around with the same question: what are corporate matching gifts? Corporate matching gifts are additional donations made by a company to an organization supported by their employee(s). Basically, if a person donates money or time to an organization, their employer will donate to the organization as well. Double the Donation’s database includes 20,000 parent companies, subsidiaries, and alternate spelling variations. 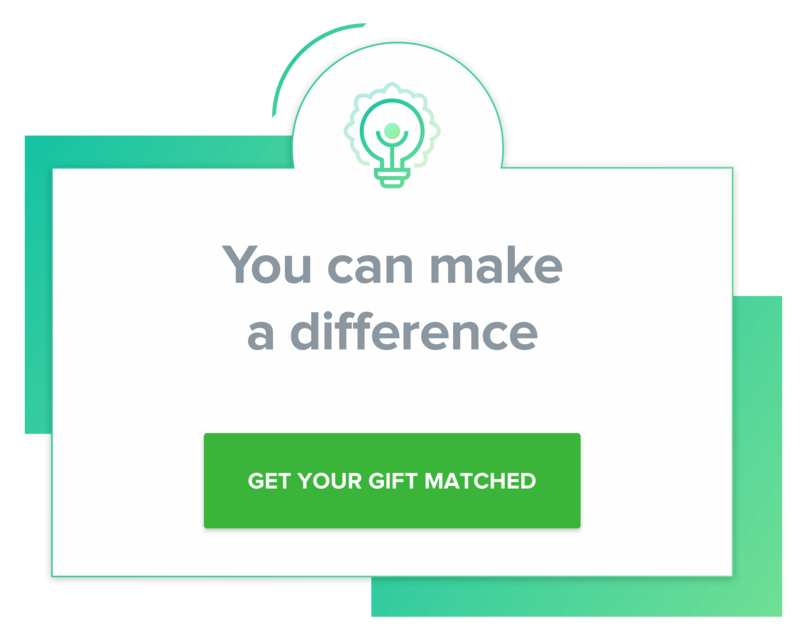 By installing Double the Donation’s matching gift search tool and putting all this information at your donors’ fingertips, you’ll be sure to increase your overall matching gift revenue! Most often, a company will match an employee’s donation exactly, known as a 1:1 match ratio. Sometimes, a company will only match half the original donation, 0.5:1, but there are also companies who go as high as 4:1! The ratio offered to an employee can also change based on the employee’s level of employment. For example, a part-time worker might be eligible for 1:1 matching, while a VP is eligible for 2:1. Another element of matching gifts to be aware of are company-specific minimums and maximums. This refers to the amount of money that qualifies for a corporate match. It varies company to company, but the most common minimum is $25. If a match-eligible employee at a company with a minimum of $25 donates $15, that gift will not be matched. If the maximum qualifying amount is $500, but an employee donates $1,000, only $500 will be matched. This is still turning $1,000 into $1,500, which is amazing! The most important thing to remember about matching gifts is that there is always an expiration date on matching gift requests. The most common deadlines for matching gift requests are timed around the end of the year and tax season. In addition to doubling (or more) a donation, just mentioning matching gifts has been proven to increase the average donation amount by 51%. Higher donations mean higher amounts to be matched. Initial Donation: In order to get a corporate matching gift, there must be a gift to match. Donations can be made online or via check. We highly recommend installing a matching gift search tool directly into your donation form, so donors can easily and immediately check to see if their employers offers a matching gift program.QUICK TIP: 360MatchPro is a fantastic software that allows donation form integration and provides automated email follow-up to all your donors! 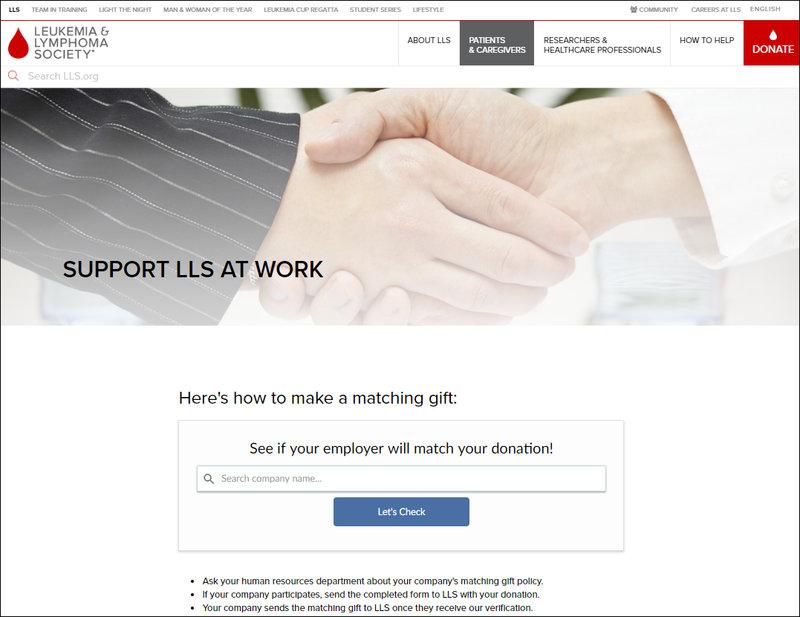 Submit Matching Gift Request to Employer: Donors can find more information about their employer’s matching gift program on the company’s website or by contacting the company’s HR department. 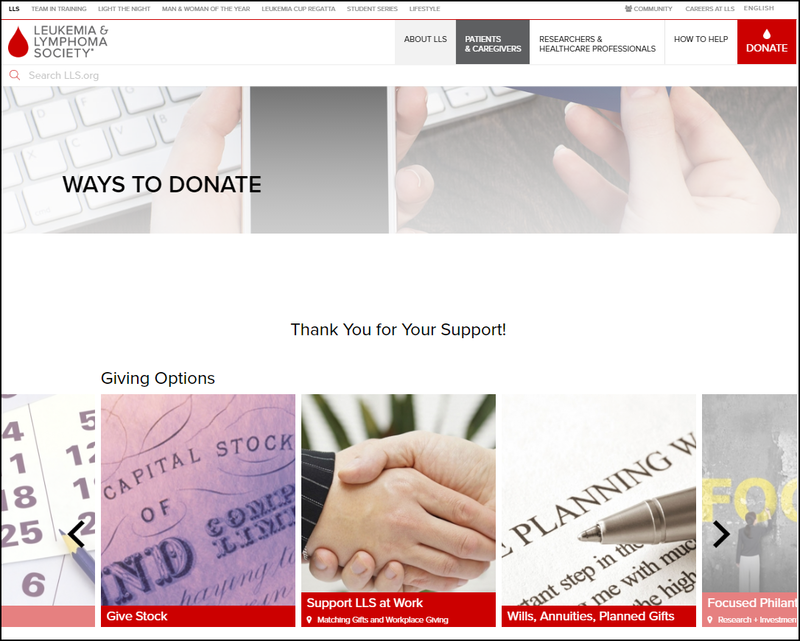 Double the Donation, a matching gift search tool, offers plenty of free resources on matching gifts. Company Determines Eligibility: Before a matching gift is delivered, a company’s matching gift team will review the initial donation to be sure that it qualifies for matching. They consider the amount of the initial donation as well as the nonprofit receiving the donation. Nonprofit Confirms Initial Donation: Before delivering a matching gift, a company or corporation will check with the nonprofit to confirm that their employee made a donation of the reported amount. Nonprofit Receives A Check from The Employer: The final step, of course, is the nonprofit actually receiving the matched gift from the original donor’s employer. That initial donation has officially been doubled! Though this process does require a bit of extra work from your donors, they are already interested in furthering your mission, so they will often take the extra steps required to see that their contributions make an even bigger impact. Now that we are all experts on matching gifts, let’s talk about how we can use matching gifts to really supercharge funds raised through peer-to-peer fundraising. Quick Review: Peer-to-peer fundraising is a method of fundraising that allows supporters of your organization to raise more money by seeking donations from their own networks and communities. Here’s the thing, peer-to peer fundraising is already multiplying one initial donation into many by encouraging one supporter of your organization to gather additional donations. With matching gifts, there is potential to double many of those additional donations. It is extra money on top of extra money. But how do matching gifts come into play? Well, instead of paying a member of your organization’s team to oversee matching gifts, you have an eager supporter ready to gather those donations for you. The most important thing to remember is that your initial supporter is your strongest resource. That supporter is passionate enough about your organization to set up his or her own fundraiser, and that enthusiasm can be channelled into more and more dollars donated. The best way to gather matching gift revenue during your peer-to-peer fundraising is by integrating a matching gift search tool straight into the customizable fundraising pages that your participants activate for your fundraiser. 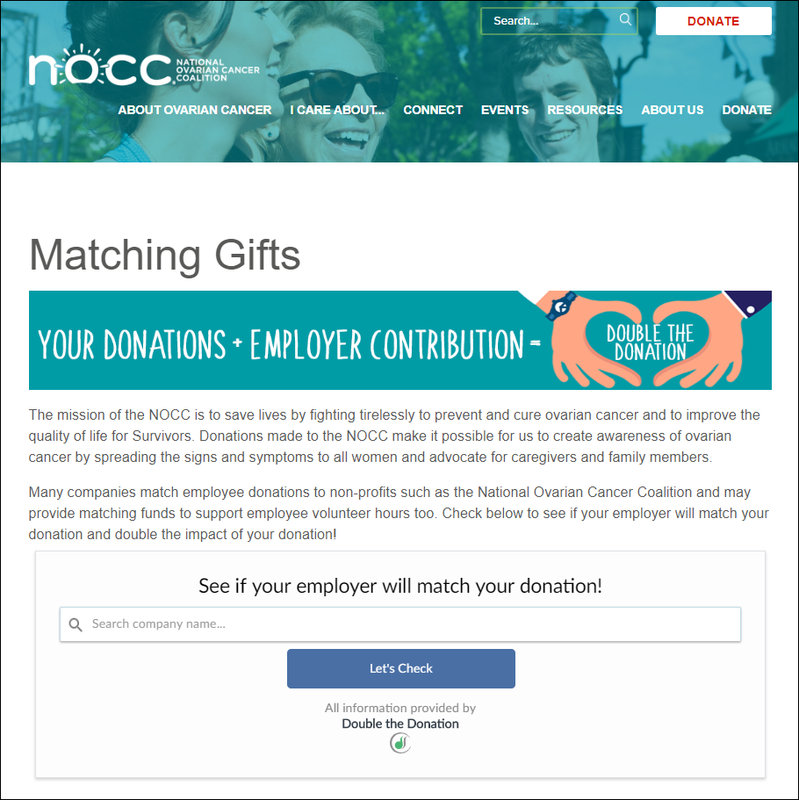 By incorporating matching gifts straight into the donation process, every donor who contributes to your original supporter’s donation page will be prompted to find out if they are eligible for a matching gift program. The biggest push in peer-to-peer fundraising these days is made on social media. When your fundraisers share their donation pages, they should include some information about matching gifts. The captions on these social media posts should inspire donors to find out about their employers’ matching gift programs. Just mentioning matching gifts increases response rate by 71%, so it is definitely worth including. In addition to social media posts, you can suggest that your participants hold fundraising events in their communities. They can use mobile devices to collect donations at the event and distribute information about matching gifts in person. There are many ways to spread the word about matching gifts at an even, including physical handouts about matching gifts given to everyone at the event, or a speech delivered to the crowd about the beauty and simplicity of matching gifts. No matter how the information gets out there, it is important that the information always comes with a call to action: check your match-eligibility and request that match! Remember to remind your fundraisers (and by extension, their donors) that matching gifts are free money. These funds are being raised for a good cause, so encourage your fundraisers to push that point home. Just a little bit of effort can go a very long way. There are plenty of organizations out there already incorporating matching gifts in their major peer-to-peer fundraising events. Lucky for you, we’ve gathered a few of those top-notch examples! LLS is a huge organization working to raise money for, you guessed it, Leukemia and Lymphoma research. They have seen the impact that matching gifts can have on their annual revenue, so they have fully committed to spreading the word about matching gifts. Which leads to their dedicated matching gifts page! 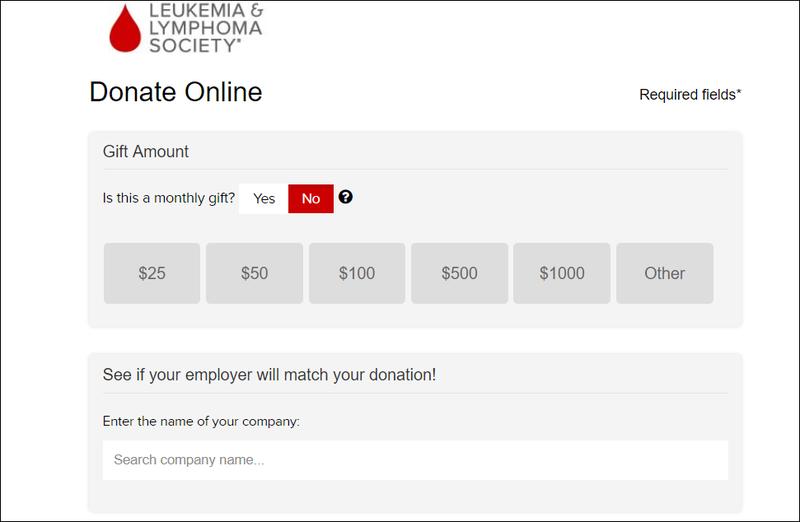 Plus, LLS provides this search tool or any relevant program information again on the confirmation page after a donation is made. They really know how to maximize matching gifts! 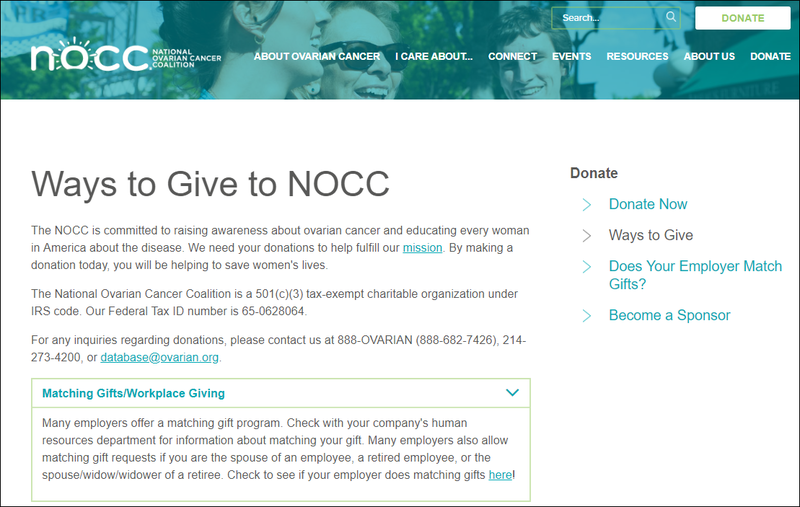 The National Ovarian Cancer Coalition also makes sure that their donors take advantage of any opportunities to have gifts matched. But they also link to a separate dedicated matching gifts page! Your organization should take a page out of these books and start raking in that matching gift revenue! So what can you do as a nonprofit organization running a peer-to-peer fundraising campaign? Communicate with your participants! Share all of the fun and easy ways they can raise more money with matching gifts. When they first set up their donation page, send an email thanking them for signing up to raise funds for your organization. In this email, include some information about matching gifts and explain the impact that they can have. In addition to that first email, send out fundraising tips and tricks that incorporate matching gifts, like the ones we discussed above. Plus, you can use your own social media pages to spread the word about matching gifts and spotlight fundraisers who are driving matching gift donations through their own social media and events. Takeaway: Matching gift revenue is an often untapped resource for free money. It is easily claimed, and now all you have to do is show your supporters how to claim it. Happy fundraising!